It was expected of the landed gentry that they provide lavish entertainment for their guests many of whom were connected to the royal household and government, and invariably this required the laying on of sumptious banquets. But in the days before refrigeration storing food was a real headache, until someone thought of the idea of an ice house . . . 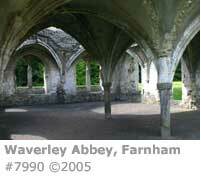 Given its location on the major transport routes between London and the south coast maritime ports, it's not surprising that the Wey Valley had more than its fair share of visits from powerful historical figures. Not all brought with them goodwill, and one in particular more than outlived his welcome. Czar Peter the Great of Russia lodged at the Kings Arms in Godalming in the 17th century. His stay, accompanied by a large and particularly boisterous entourage, turned into such a nightmare for the landlord of this once important coaching inn that it almost drove him into bankruptcy. Not only did the party stay on for much longer than expected, but they proceeded to eat and drink their host out of house and home, and showed no signs of paying for their stay. Their notorious partying also resulted in substantial damage to his property. The Czar and guests finally moved on to stay as the guests of the diarist John Evelyn, which prompted Evelyn's bailiff to describe them as "right nasty people." We now take our refrigerators and freezers totally for granted, but how was food kept fresh or stored for any length of time before they were invented? 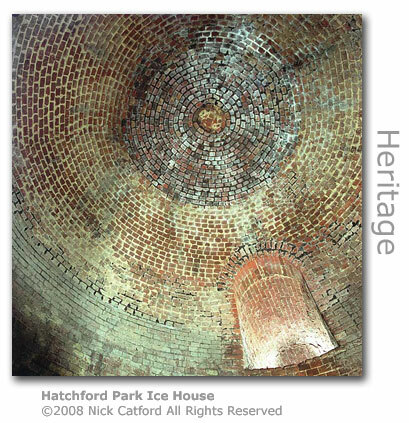 It was only the very rich who could afford an ice house, and these tended to be built and maintained for the large estates and manor houses who needed to store substantial amounts of produce for the lavish entertaining that was common in those days. The idea became popular in the Wey Valley during the 16th century at a time when ice was cut from local ponds and rivers to be used to make cold sweets or as beds for cold dishes. Winters were much colder then but during the summer months when the ice was most needed the supply was unavailable, so the estates started to build underground chambers to prolong the storage period. The chambers were to provide the additional benefits of being able to keep food for longer, chill wine in the summer months, and even have ice available for elaborate ice sculptures to outdo the Joneses at society banquets. 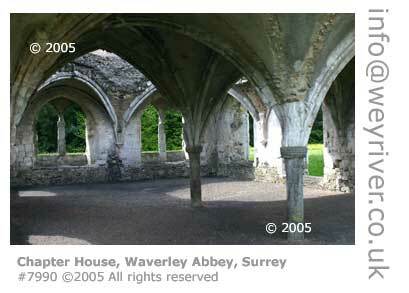 The ice houses were built into the ground by excavating a chamber either on flat ground or dug into a hillside or mound. The base of the chamber in simpler structures was left as bare ground, but for the larger more sophisticated ice houses this would be paved with a drain dug to carry melt water away. The chamber was lined usually with brick and roofed before being covered. Some of the larger estates would have extensive structures often with a passage, several outer storage chambers and a central ice vault. There would be a series of doors installed to maintain the low temperatures required. 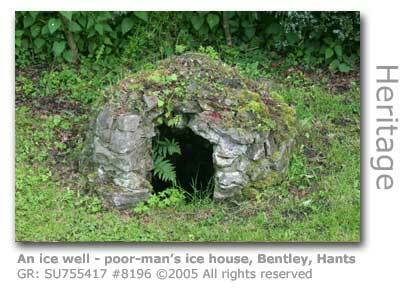 Often located near to the pond or other source of ice, it was usually the job of the estate gardeners to cut and transport the ice to the chambers. A common method of storage involved the laying down of straw between the layers to facilitate in the later removal of the supplies needed. The less grand landowners developed ice wells which were a small lined chamber dug into the ground, lined and capped with an access point that enabled the ice to be loaded and removed from above. 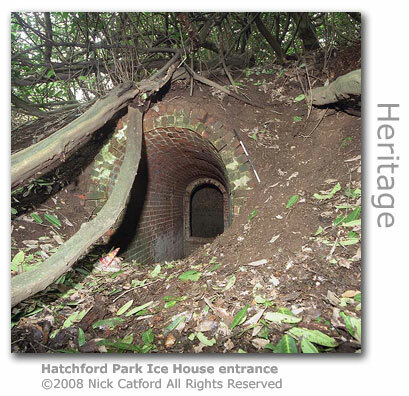 There are a number of good examples of ice houses throughout the Wey Valley with the best preserved at Hatchlands in East Clandon in Surrey. 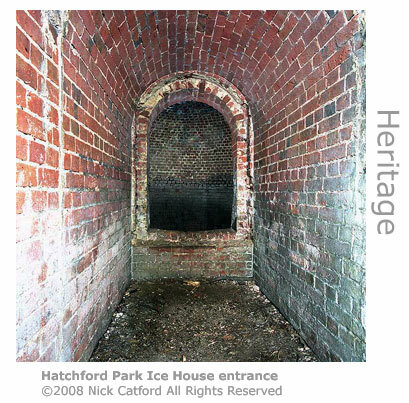 The ice house here was built at the same time as the main house in 1757 and is owned by the National Trust. Others, although sadly not open to the public, are at Foley Manor near Liphook in Hampshire, Tilford House in Tilford, Surrey and Hatchlands Park (SEE BELOW) near Ripley, Surrey. The development of steamships and the railways provided a fast and efficient way of transporting ice from the Nordic countries, and even as far away as North America, a more expensive way of securing supplies but the imported ice was coveted for its greater purity. It was not until the 1920s that technology for providing refrigeration became widely available and the ice houses became redundant. A large house was built at Hatchford Park (GR: TQ093582) in Ockham near Ripley in the mid 18th century and close by a large ice house was constructed beneath the ground to service the household. The domed structure built of brick measures some 20 feet (6m) across by 20 feet tall and is accessed through a long brick lined corridor.